Jones Naturals, LLC. has always been very proud to have the American flag on all of our products. 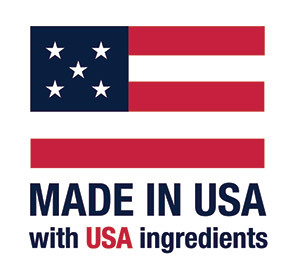 All of our products are 100% grown and made in the USA. We know you care about what you feed your pets. The quality of our products is very important to us. We go out of our way to provide safe and wholesome edible chews and treats for your furry family members. We have a very strict HACCP (Hazard Analysis Critical Control Point) plan in place. Stringent cleanliness guidelines, product testing (in our in-house lab along with outside laboratories), and product lot code and tracking, are just a few things the HACCP plan covers. 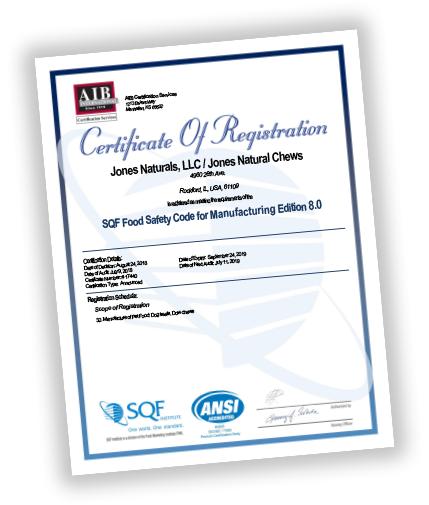 We are proud to announce that we have completed the level 2 SQF certification. The Country Butcher’s purpose is to design and manufacture high quality all natural, safe treats and chews made 100% in the USA for all sized dogs to enjoy. 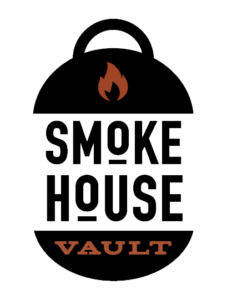 Our commitment to continually improve its food safety program and by being aware of regulatory requirements has achieved brand recognition and customer loyalty. We strive to continually be at the forefront of creating new products and being a leader in the pet industry.